CHICAGO — Dominik Kahun had two goals and an assist, Cam Ward made 43 saves and the Chicago Blackhawks beat the Detroit Red Wings 5-2 on Sunday for their seventh straight win. Chicago’s second line of Kahun, Dylan Strome and Alex DeBrincat delivered once again as the Blackhawks continued their surprising push after a lackluster first half of the season. Strome had a goal and two assists, and DeBrincat extended his career-best point streak to eight games with three assists. After Detroit pulled within one in the third period, Patrick Kane responded for Chicago with his 33rd goal. Kane made it 4-2 when he beat Jonathan Bernier low on the stick side with 3:33 left, extending the NHL’s longest active point streak to 14 games. Gustav Nyquist and Christoffer Ehn scored for Detroit. 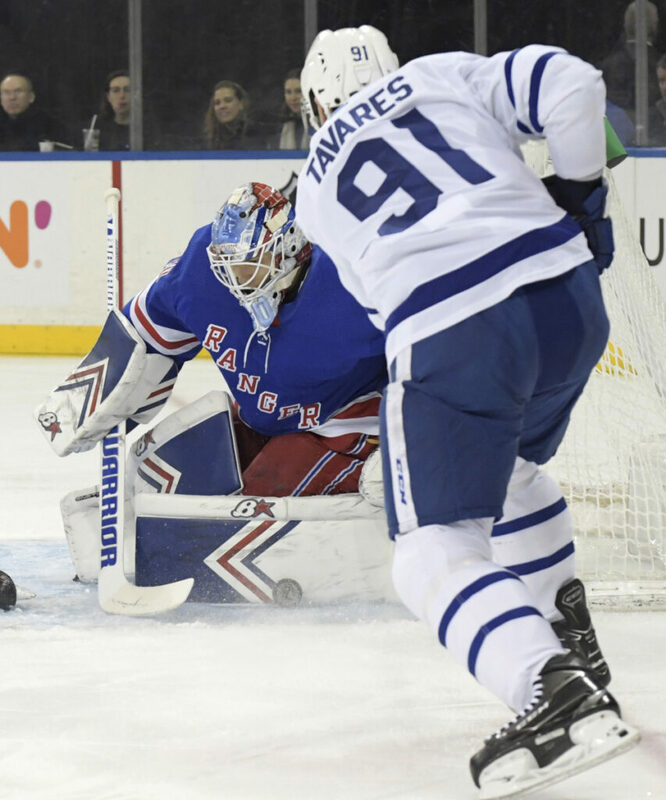 RANGERS 4, MAPLE LEAFS 1: Alexandar Georgiev had a career-high 55 saves on his birthday to lead New York over visiting Toronto. LIGHTNING 5, PANTHERS 2: Nikita Kucherov had two goals and an assist to lift visiting Tampa Bay. Brayden Point, Ryan Callahan and Steven Stamkos also scored for the Lightning. Louis Domingue made 25 saves. ISLANDERS 2, WILD 1: Devon Toews scored the tie-breaking goal early in the second period, Thomas Greiss stopped 26 shots and New York beat visiting Minnesota. JETS 3, SABRES 1: Blake Wheeler scored the go-ahead goal by redirecting Josh Morrissey’s centering pass with 3:55 remaining and Winnipeg won at Buffalo, New York. Connor Hellebuyck made 35 saves to help the Jets end their longest winless streak (0-2-1) of the season . BLUES 5, PREDATORS 4: Vladimir Tarasenko completed a hat trick by scoring 16 seconds into overtime, and visiting St. Louis won its sixth straight. DEVILS 3, HURRICANES 2: Marcus Johansson scored twice and Keith Kinkaid made 32 saves as New Jersey won at home. DUCKS: The Ducks fired Boach Randy Carlyle amid a seven-game losing streak and GM Bob Murray will take over as interim coach for the remainder of the regular season. Anaheim will name a new coach following the season.